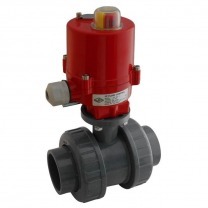 Electrically actuated PVC ball valves are ideal for automated water flow control. PVC is very suitable for contaminated water or corrosive media, such as chloride solutions (seawater or swimming pools). Besides that, PVC is resistant to many salt solutions, acids and bases and solvents. Look at the material table for a complete overview.